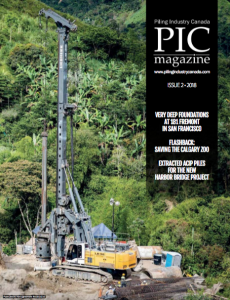 December 5, 2011 - Industry News - Tagged: Atlas Copco, Condon-johnson, Cotton, landslides, Mario Garcia, Mission Ready Mix, Scott Ellenbecker, Shires and Associates, Southern California, The Landslide Repair Foundation, Unigrout Flex D group pump, Vista Steel Co.
Southern California is famous for its beautiful mountaintop homes with impressive vistas. The region is also famous for wildfires, earthquakes, and mudslides. Occasionally, this heavily populated area of the country needs a little help holding it all together. The Landslide Repair Foundation (the Foundation) is a nonprofit organization formed after a group of 66 homeowners settled a lawsuit brought against the California Department of Transportation (Caltrans) arising out of work it had previously performed to the lower mountain slope. As a result of the earlier work, the entire mountain became unstable and began to slide. A $50 million settlement in favour of the plaintiffs secured an opportunity to shore up the mountain the right way – in more ways than one. The Foundation retained the engineering firm of Cotton, Shires and Associates (CSA) to do the geotechnical design work. The multi-phased construction project was awarded to Condon-Johnson & Associates Inc. The project is located in Santa Barbara, California, in the Sycamore Canyon area. Construction began in 2008, with the work scheduled for completion in the summer of 2011. Tom Baddeley is the project manager for Condon-Johnson, overseeing the process. Mario Garcia is the superintendent on the project. Baddeley said the job utilizes “a top-down construction method by installing a series of walls with integrated drainage to hold the mountain in place.” Upon completion, the walls will be buried and the terrain will be graded to resemble natural grades. Baddeley said the project is progressing “like clockwork” and has “gone as well as any job I have ever done with Condon-Johnson.” He attributes this to the relationship with the project owners and engineers and timely delivery of steel and concrete from Vista Steel Co. and Mission Ready Mix. The Foundation is governed by a board that meets once a month, yet will meet as necessary based on the project’s needs. Unlike jobs governed by bureaucracy, this project enjoys a relationship between the owner, engineer, and contractor that results in changes that can be presented, agreed to, and implemented without delay. In total, seven walls will be installed with each running at varying elevations along the natural curvature of the mountain’s face. The walls are installed as a multistep process; each new wall is constructed as the crew works down the mountain. Each wall is a series of piles anchored to competent material with rows of tiebacks every five vertical feet. Once the 48-inch diameter concrete piles are installed, the tieback holes are drilled through the pile at a 20 degree incline. These six-inch holes will penetrate the mountain at varying depths, 57 feet to 220 feet, depending on where they are located on the mountain. Once the tiebacks are installed they are tested to 415 kps then backed off to 312 kps and locked in place. Each pile has, on average, five rows of tiebacks totaling over 1.5 million pounds of tension. When completed, each wall will have about 200 tiebacks. Getting the grout under pressure to the various points on the mountain is the job of an Atlas Copco Unigrout Flex D grout pump. The D stands for diesel, which powers the hydraulic pumps. One of the reasons Garcia likes the diesel unit is because it’s easier to maintain on site. The crew has had no problems with the Atlas Copco unit. They work with Atlas Copco to supply parts and do the preventative maintenance themselves on location. Another reason Garcia likes the Atlas Copco unit is because it mixes the material thoroughly. Flaws in the material can cause problems in frictional strength in the tieback. Having to redrill a lost tieback would cost time and money. Each batch of grout requires 10, 94-pound bags of mix. This 940 pounds of grout mix combines with 50 gallons of water to fill the hopper. He said each tieback averages two to three hoppers of grout. The hole is filled with grout pumped at 200 psi through a one-inch line. To place grout in the hole, a PVC pipe is inserted to the bottom of the hole where it (the PVC pipe) will remain after the hole is filled. Once load tested and covered with shotcrete, the balance of the hole is filled with grout to complete the process. When completed, the new walls on this mountain in Santa Barbara will make the homes virtually impervious to sliding into the valley below. This is possible with thousands of pounds of concrete secured through a series of steps tying the mountain together. The goal of Condon-Johnson is to secure the mountain; the homeowners are doing their job too, by making this a smoothly run project. Scott Ellenbecker is editor-in-chief of multiple in-house publications for Atlas Copco. He has been involved in marketing construction, mining, and drilling equipment since 1995.